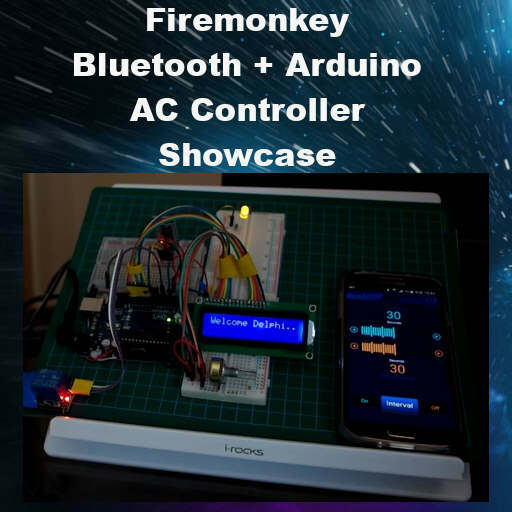 Developer Sanghyun Oh from Korea has released a Bluetooth + Arduino + Android controller app for an AC power plug. The app is built with Delphi XE8 Firemonkey and is demoed controlling a fan. Full source code for the Arduino side and the Delphi XE8 Firemonkey side is available. The app is built for Android but also may work on IOS, Windows, and OSX where Bluetooth is available. In addition to the Bluetooth module and the AC module on the Arduino there is also an LED board which the Delphi app can display messages on. The Delphi app itself contains a timer control in addition to being able to turn the AC plug on and off so that it can turn off after a specific amount of time. A setup like this could be used in home or industrial automation. You should be able to use this code with Appmethod as well. Head over and check out diagrams and more info about the Delphi XE8 Bluetooth + Arduino + Android app before downloading the source code.